A West Coast school teaches the ancient art of handling birds of prey. Diego, a Harris hawk, land's on his falconer's outstretched arm. Nikita grips my left arm so tightly that it hurts, despite the leather glove that shields me up to my elbow. She's staring at me with inky eyes, and I can tell she's got a lot to teach me. To that end, I've come to her home turf, a field long abandoned by the forty-niners of central California's gold rush. Nikita is a Lanner falcon, and her handler, Jim Tigan, 48, keeps her and nine other birds of prey - including owls, hawks and more falcons - plenty busy. 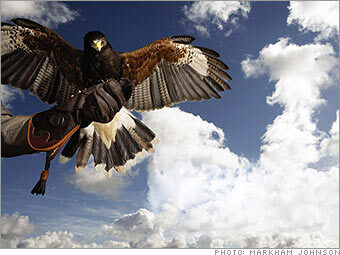 Tactical Avian Predators (tacticalavianpredators.com), Tigan's Browns Valley, Calif., company, contracts with governments and corporations to rid airports and businesses of nuisance birds. Tigan recently finished an eight-month job for candy manufacturer Mars eradicating starlings from one of its Nevada plants. When Tigan and his flock aren't working, they teach the ancient craft of falconry: the hunting of wild game by a trained team of human and raptor. In most states a falconer must spend two years as an apprentice before getting a license; I'm taking the three-day introduction at Tigan's West Coast Falconry Academy (westcoastfalconry.com). "Maintaining a falcon is hard," Tigan warns me on the phone before I arrive, giving me a chance to back out. Insulted, I reaffirm to Tigan that I want the full experience, blood, guts, and all. I want to stand eye-level with one of the fastest creatures on earth, becoming its partner for an afternoon of preying.